Disney theme parks have featured a variety of 3D movies over the years. Tokyo Disneyland has had a couple, the most recent being MicroAdventure!. 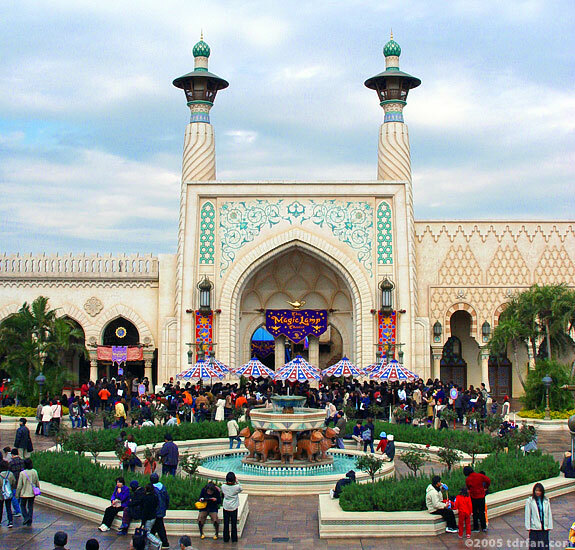 The Magic Lamp Theater takes the 3D movie a step further, by adding live performers to the show. The star of the show (or perhaps the co-star, as the case may be) is Genie from the Disney movie Aladdin. He is presented in as an animated 3D character, projected on a large screen at the upper part of the theater. The bottom section features a stage with a couple of live performers: a magician and his sidekick. With this combination, the show is really two shows in one, part live-action magic show and part 3D movie. The movie and the live performers integrate perfectly; the effect is convincing and brilliantly done. The live magic-show element of the show features top-notch stage illusions, while Genie pops in and out to offer his assistance at various points during the performance. There is also a comedy element to the show, but because the dialog is entirely in Japanese you won't be laughing much if you don't speak the language. Still, a lot of the comedy is physical, and the show is entertaining from start to finish even if you don't understand what they're saying. Like other 3D movies, you need to wear special glasses to see the 3D effect. I would have thought the glasses would have muddied or distorted the view of the live performers, but they do not. There is also a cute pre-show in the queue area (3D glasses not required), but again, the dialog is in Japanese. During the day the lines here are long. However, the lines dissipate in the evening and if you come later in the day you can probably get in without waiting in any line at all. Despite the language issues for those who don't understand Japanese, I would definitely recommend seeing this wonderful and unique show.